Experience Jabba the Hutt like never before in a classic comic exploit! Most Star Wars fans know that Jabba the Hutt made his silver-screen debut in 1983’s “Return of the Jedi.” Only in 1997, with the release of the Star Wars Special Edition, could George Lucas finally insert a scene he had cut, with Jabba directly confronting Han Solo at Docking Bay 94. But the absence of Jabba in “Episode IV” didn’t stop Roy Thomas and Howard Chaykin from including their own interpretation of the character in STAR WARS #2. 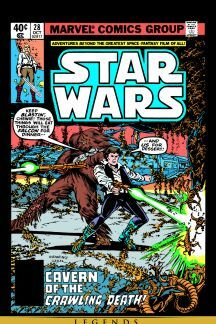 The thickly whiskered humanoid figure they created may not rank among the “best” moments in Star Wars comics—but it’s certainly among the most interesting to go back to. Two years later, Thomas teamed with artists Carmine Infantino and Gene Day to bring the space gangster back as the main villain for STAR WARS #28. The story entitled “What Ever Happened to Jabba the Hut?”—he didn’t have two T’s in “Hutt” yet—responds to its own question on the very first page: “Answer: He is alive and well and trying to kill Han Solo on an obscure planet called Orleon.” The pages to come highlight Han’s escape from the planet, ending with Jabba donning a space suit to pursue the Millennium Falcon. 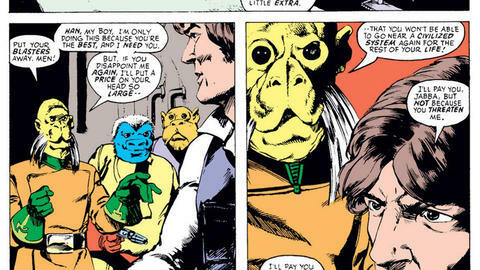 Reading issue #28 today, we’re forced to wonder: What would the “real” Jabba look like in a space suit?